Vasilii Mihailovich Fomin was born on November, 5, 1940 in Krasnodar in the family of employees. With the beginning of the war in 1941, his family has moved to Kazan. His father Mikhail Aleksandrovich was the known person in the city, a permanent correspondent of “Izvyestiya“ newspaper. His mother Tatyana Semenovna worked as a bookkeeper in a factory. In 1957, V.Fomin has left high school. However, he did not succeed in entering the Kazan university at once. Successfully having passed seven entrance examinations, the entrant has not gained nevertheless one point to enter. For a year, Vasilii Fomin worked as the electrical engineer in the tram-and-trolleybus park and prepared for the new high school examinations. The second attempt was successful. Since September, 1, 1958 V.Fomin became the student of the mechanical-and-mathematical department of the Kazan university. The sister of his father who was the teacher of mathematics had the great influence on his speciality choice. The Kazan university always was famous for its traditions and strong schools of thought. In the late 1950s, one of such schools was a special seminar of the head of hydromechanics faculty professor G.G.Tumashev, Doctor in Physics and Mathematical Science. The creative atmosphere of these seminars attracted the students who attended it, and so did the possibility of an independent choice of the theme, and at the same time, high insistence of the supervisor of studies. Specialization began since the third grade. G.G.Tumashev was a known scientist, the founder of advent and development of a new section in the theory of analytical functions in the USSR, namely, the theory of inverse boundary value problems, the problems to determine the form of boundaries of the stream of liquid or gas from the given distribution of the velocity or pressure. 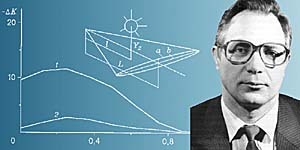 G.G.Tumashev was the first one in the world who has solved the problem of construction of the isolated profile and system of two profiles by method of conformal mappings, the problem to determine the form of the arc, which is flown round with the jets separation, from the given velocity distribution over a surface. Application of the inverse boundary value problems has been widely developed in the theory of filtration. It has made it possible to find the underground contour of a dam, which has the preset filtrational parameters to define the condition of a soil stream. The history of the development of inverse boundary value problems is more than 30 year old. The basis of the theory of the inverse boundary value problems for analytical functions has been created in this time, and the large number of practically important applications to various problems of mechanics of continuous media has been presented. Success in the field of scientific developments and practical application of their results made it possible for G.G.Tumashev and for M.T.Nuzhin, the rector of the Kazan university, the head of the faculty of theoretical mechanics, to create scientific school of mathematicians and specialists in mechanics in Kazan, which is now working in many scientific centres, including Novosibirsk. The great influence on scientific education of the students as the researchers was made by professors A.P.Norden (lections on analytical differential geometry), L.I.Chibrikova (lections on the differential equations), M.T.Nuzhin (lections on the theory of the strength of materials), and other professors. There were many bright students in V.Fomin's student group. From 20 persons, who graduated from the University from this group, two thirds became candidates of sciences, and six persons have defended the dissertations for a doctor's degree. An interesting fact illustrates the extent, in which the students have been oriented to a research work. Even at the fourth grade, V.Fomin has prepared, under the supervising of G.G.Tumashev and in the co-authorship with him, the report on the 2nd congress on the mechanics in Moscow and he has successful presentation on the section. In 1963, after graduating from the university, V.Fomin has entered the postgraduate study at G.G.Tumashev's Chair, where he has prepared under his supervising the PhD thesis into “An approximated method of research of vortex motions of gas with under- and supersonic velocities”. The defence of the theses took place in 1966; the 27-year old candidate of physical and mathematical sciences began working as the assistant at his original department, without stopping at the same time his active scientific activity. In 1969, V.M.Fomin has made an application to participate in the conference in Novosibirsk, which was held by N.N.Yanenko. Having learned that his report is included in the program, he was very much delighted: he already wanted a long time to visit Academgorodok. At that time, V.M.Fomin did not assume that this business trip will define much in his further life. The Report of the young scientist from Kazan was of great interest for Novosibirsk colleagues, and N.N.Yanenko has suggested to Vasilii Mihailovich to think of the possible moving to Siberia. V.M.Fomin's solution was affirmative, and since his 30 his destiny is connected with the Novosibirsk centre of science. However, due to some circumstances, Fomin did not get fixed up in his job in N.N.Yanenko's subdivision of the Computing center of SB AS USSR at once. In 1970, he was admitted upon competitive examination at the position of senior research assistant in ITAM and began to work in the laboratory of V.G. Dulov. After a while, Vasilii Mihailovich has taken over the management of group, which dealt with the problems of nonlinear phenomena and variational problems of gas dynamics. In parallel with this activity, besides the compulsory research, V.M.Fomin pays much attention to the problems of mechanics of heterogeneous media. Together with his colleagues, in 1970 – 1973, a series of works has been made into construction and verification of mathematical models to describe the streams of gas-and-particle mixtures inside the channels of variable geometry. This allowed a calculation procedure to be given to application researchers to predict the impulse losses owing to the two-phase nature of the stream in channels. In 1973, the part of V.M.Fomin's group has been admitted into the department of numerical methods of the continuous medium mechanics of the Computing center of SB AS USSR and started its work in close cooperation and under the supervision of academician N.N. Yanenko. Vasilii Mihailovich considers himself to be a representative of N.N. Yanenko's scientific school. In the Computing centre, he needed to begin all over again. V.M.Fomin started to work in the numerical modelling of processes of high-speed interaction of solids. The new theme was a complicated one, but the satisfaction from his work was high. The problems put by N.N.Yanenko went from practice, from industry, from his previous life period. It is the known fact that N.N. Yanenko dealt with the problems of creation the nuclear weapon in Chyelyabinsk-70 (Snezhinsk). In the Computing centre, the subjects of work have been substantially expanded due to the problem connected with meteoric protection of the spacecrafts. The problems for the velocity of impaction more than 5 km/s and less than 5 km/s (the latter was also important to study the armour properties for the modern tanks) have been solved. V.M.Fomin has headed the small group of young collaborators who were engaged in simulation of impaction problems. The same scope of problems was actively solved in the Institute of hydrodynamics by means of experiment (V.M.Titov, Yu.A.Trishin, Yu.I.Fadeenko, V.V.Mitrofanov). They managed to make active creative bonds between two organizations: the outcomes of the calculations conducted in the Computing centre were verified experimentally in the Institute of hydrodynamics. An outcome of this work was creation of the first mathematical models and methods to solve the given class of problems, together with the development of the associated software, which has been introduced then at the branch manufactures. In October 1976, the department of the numerical methods of continuous medium mechanics (50 persons) has been moved from the Computing centre into ITAM. During 1976-79, V.M.Fomin is in charge of the ITAM laboratory of physics of high-speed processes N 24 and the head of the department of gas dynamics of multiphase systems. Scientific activity of the department has been related to the construction of physical and mathematical models that describe the streams of both multiphase and elasto-plastic media, and to the development of algorithms of their numerical realization at the computer. In the late 1970s, V.M.Fomin was already moulded and known expert in the field of mechanics of continuous media, the author of about 70 scientific works into the problems of gas dynamics, solid body, and numerical methods. The main field of his research is related with the development of the procedure to approximate the equation of state and to construct the mathematical models of the problems of continuous media mechanics with complex physico-chemical processes. The development of the approximation method has allowed him to find the solutions in the analytical form with mono- and bi-functional arbitrariness of differential partial equations both for hyperbolic and for elliptical equations with degeneration of the order. This has allowed V.M.Fomin and his employees to find the closed form decision of a class of problems into the gas jets, into constructing the supersonic nozzles from the given distribution of velocities on them. With the use of analogs between the plane supersonic stationary movements of gas and one-dimensional nonstationary currents, the given method has been successfully applied to the problems of the nonlinear theory of filtration and to a research of nonlinear problems of propagation of shock waves in dense media. For all of these cases, V.M.Fomin found solutions in the final form that were convenient for an approbation of numerical algorithms. Both domestic and foreign contributors started active referring to his scientific results in this field. The second cycle of works in 1970s has been related to the construction of mathematical models of media with the complicated physical and chemical phenomena, the streams of multiphase mixtures of type gas + solid impurity. The created methods of calculation have been applied to the problems of chemical engineering and in modelling of processes in RESF. Outcomes of the work into the research of the currents of multiphase mixtures of type gas with solid particles were included into the first large monograph, prepared by N.N. Yanenko, A.N.Papyrin, and R.I.Soloukhin in cooperation, which was named " Supersonic two-phase currents under conditions of high-speed nonequilibrium of particles " (Novosibirsk, 1980). Constructing of the mathematical models describing behaviour of the condensed bodies under great dynamic loads was extremely actual problem in relation to the creation of the controlled-quality materials and studying the phenomena of high-speed interaction of the bodies under deformation. V.M.Fomin has suggested a mathematical model, in which the set of movement equations was closed by the nonholonomic equation of state. The properties of this system have been studied with the differential bonds applied. Outcomes of the research into the currents of multiphase mixtures of type gas with solid particles have been applied in the problems of chemical engineering and in simulation of processes in the rocket engines. The constructed mathematical models describing behaviour of the condensed bodies under great dynamic loads have been finished to algorithms, which have allowed creating the complex of programs to research the processes arising at high-speed interaction of bodies within the limits of hydrodynamic and elasto-plactic approximations. Outcomes of this research have made it possible to predict the behaviour of complex elements of structures under extreme load conditions. The created complex of programs on numerical modelling of high-speed interaction of bodies has been introduced in a number of manufactures in the country (in the branch scientific research institutes, designer and production engineering offices of the machine-building organizations). In 1981, V.M.Fomin, together with the group of authors, was awarded with the State premium of the USSR in the field of science and technology for the cycle of works into automated design of the new technical products. In 1980s, V.M.Fomin was engaged in the research in the field of modelling the processes of high-speed interaction of homogeneous and heterogeneous particles. His works of this stage were devoted to the development, substantiation, and application of analytical and numerical methods of solution of the nonlinear equations for the problems of mechanics of the continuous medium. With the use of approximation methods for the equations of state and differential relations, the solutions in the analytical form with mono- and two-phase arbitrariness for the set of equations have been obtained, which allowed one to solve the certain classes of boundary value problems of gas dynamics, of the nonlinear theory of filtration, and propagation of waves in the heterogeneous condensed media. In 1982, V.M.Fomin has defended the theses for a doctor's degree named " Numerical modelling of high-speed interaction of bodies ", and in 1984, his second monograph (co-authored with A.M.Grishin) " the Interfaced and nonstationary problems of mechanics of the reacting media " appeared. Vasilii Mihailovich combined his scientific work with the administrative activity and teaching. In connection with moving of the department of numerical methods of the continuous medium mechanics from the Computing Centre and with the expansion of ITAM subjects, an additional position has been introduced in the Institute by the directive of SB AS USSR Presidium in 1979, the one of the Deputy and Scientific Director, to which V.M.Fomin, PhD in Physics and Mathematics, was nominated. The characteristics made for Vasilii Mihailovich's presentation for this position said: "... great erudition in the field of mechanics of continuous media and its engineering applications, the good knowledge of the collective, mellowness, and the accumulated experience will facilitate V.M.Fomin's work at the position of the Deputy and Scientific Director ". V.M.Fomin combined the work of the Deputy and Scientific Director of ITAM with the laboratory management, and heading an institute department. In the middle of 1980s, he was the Chairman of thematic seminar of ITAM on gas dynamics of multiphase systems, the member of three specialized councils for the defence of dissertation theses and of several coordination councils on the industry problems. For several years V.M.Fomin was the member of the editorial board of the collection of proceedings " Numerical methods of mechanics of the continuous medium " and " Mechanics " abstract journal. Vasilii Mihailovich's teaching work developed as follows: having got already an experience at the Kazan state university, he entered at once in the educational process of Novosibirsk university in Academgorodok, and he successfully supervised over the term-final and degree works of students of mathematical and physical departments over a period of years in 1970s and red a special course " the Gas dynamics of multiphase media ". In 1979, V.M.Fomin was promoted a rank of the senior lecturer at the Chair of physical kinetics at physical department of NSU. In 1982, his manual " Numerical modelling of high-speed interaction of the bodies " has appeared. Since 1983, he has concentrated most of his efforts for the professional training in the aircraft constructing department of Novosibirsk electrotechnical institute, where he began the course of lectures " Theoretical hydromechanics ". In 1987, V.M.Fomin has been given an academic status of the full professor. By 1985, V.M.Fomin is the author of three inventions and more than 160 scientific works, 15 from which are published abroad. 10 candidates of sciences have been prepared under his supervising by then. In September, 1987, Academic council of ITAM has suggested Vasilii Mihailovich for the rank of corresponding member of AS USSR in the speciality " mechanics ". Although this action was not a success, it was indicative of the high scientific rating of V.M.Fomin in the institute. In 1989, after V.G.Dulov left for Leningrad, V.M.Fomin acted as the director of ITAM within several months. The institute, as it happened more than once in its history, was at the threshold of fundamental changes again. In the late 1980s, ITAM represented the joining of experimenters, theorists, and calculators, experts in the field of aerogas dynamics, mechanics of continuous media, of combustion, and thermal drives, physics of lasers and plasma. At the same time, it was the complex of unique aerodynamic installations and modern computers. ITAM at that time was one of the largest institutes in the Siberian branch of AS USSR. How to work in the new conditions of financing of science so that the effective work of the organization with such powerful potential is ensured? How to achieve the stability in the institute, which has gone through some changes of heads (and research lines as well), reorganizations, rearrangements and innovations? The future director should answer all of these problems, and the answers to them defined the further path of development of the large unique collective. On March, 2, 1990, V.M.Fomin has been elected the director of ITAM on the General assembly of the Siberian Branch of the Russian Academy of Science. In five years, in 1995, both collective of institute, and the members of the General assembly of the Siberian Branch of the Russian Academy of Science have prolonged V.M.Fomin's authority as the director of ITAM for the second term. In the early 90s, the most simple solution would be to reduce the personnel. The management of the institute chose another way. V.M.Fomin has changed the structure of the institute. Some laboratories have been integrated. Great attention was paid to the preparing of young scientists. During reorganization the management of institute has raised the requirements to contributors. V.M.Fomin demanded to present the outcomes of the research in the more civilized form, namely, in the form of the papers published in the reviewed scientific editions. Owing to this, more people have learned about the institute both in Russia, and abroad, and the researchers of ITAM entered in the world scientific community. A number of the western firms got interest for the cooperation with the institute. By 1990s, ITAM was leading a number of large international conferences. The scientists from USA, England, France, Germany, China, Japan and other countries became the permanent partners of institute. The legal base for the international cooperation improved with time. Based on ITAM, the International centre of aerophysical research has been created. It is the open laboratory of institute. Thanks to the uniqueness of experimental base, the students, post-graduate students, and scientific associates began coming to the institute from other countries for training. V.M.Fomin participated in the international conferences, which were held in Poland, Czechoslovakia, Bulgaria, Yugoslavia, Germany, the USA, Japan, China, etc. Scientific conferences, undoubtedly, are for benefit: the person there gets acquainted with the scientific results of the foreign colleagues, new approaches and concepts in a specific field of knowledge. But under those conditions, the main thing consisted in that each foreign trip had the concrete outcome: an inference of contracts, contracts about carrying out of joint researches, etc. Realization of the program of V.M.Fomin was fruitful. The institute, overcoming a phenomenon of budgetary consciousness, was learning to earn money, was discovering the new financing sources, and essentially strengthened the position under the conditions of economic chaos in the country. The most significant events in V.M.Fomin's scientific activity in 1990s were the premium of Ministerial council for his work in the field of mechanics in 1990, an issue of the monograph " Shock-wave processes in the two-component and two-phase media " (in the co-authorship with S.P.Kisyelyev, G.A.Ruev, A.P.Trunev, M.S.Shavaliev) in 1992, his election as the corresponding member of the Russian Academy of Science in the department of problems of mechanical engineering, mechanics, and control processes for the vacancy of the Siberian Branch for the speciality " mechanics " in 1994. By that time V.M.Fomin was the author and the co-author of 228 scientific works including three monographs and four inventions. Among his alumni is one doctor and 20 candidates of sciences. V.M.Fomin together with his alumni constructed the theory of the combined rupture and shock waves in the media of type of gas and solid particles mixtures. The method of the differential analyzer of shock waves from numerical calculations has been developed; the way to decrease the resistance of bodies in the supersonic gas stream by means of action of system of particles on the head shock wave is suggested; the theory of an impulse mechanism of destruction of bodies at the high velocities of interaction is created and justified, the complex of the programs is developed and introduced in the branch scientific research institutes and design offices of the national machine-building organizations that make it possible to predict the behaviour of structures under the extreme conditions of immersing. V.M.Fomin has an experience of scientifically-organizational work. He is the member of The bureau of the National committee on theoretical and applied mechanics, the member of editorial boards of magazines " Thermophysics and aeromechanics ", " Applied mechanics and engineering physics ", " Physical mezomechanics ", international magazine " Shock waves ", he is a member of some specialized councils. 3 - mathematical substantiation of the created models, numerical methods of solution of shock-wave problems and their verification (10 persons). The basic structure of the school includes Doctors of sciences A.V.Fedorov, V.P.Shapeev, S.V.Meleshko, S.P.Kiselev, V.M.Bojko, E.V.Vorozhiov, G.A.Sapozhnikov, A.P.Alhimov, A.I.Gulidov. All of them hold active teaching work that ensures the continuing scientific traditions.
" Professional training is one of the basic problems for our institute. I try to follow the traditions of professor G.G.Tumashev and academician N.N.Yanenko. They always stressed that the staff needs to be grown up carefully. We try to bring up the students of NSU and NSTU. We prepare the students expressly for ITAM at the department of aerohydrodynamics of NSTU. We have in the institute over 70 young specialists under 33 years. There is a competition for the post-graduate study ". Recognition of the high merits of V.M.Fomin in the field of preparing the scientific staff became the fact that according to the results of competition of International Soros education program in the field of the exact sciences, he thrice got the rank of Soros professor (in mathematics in 1995,1999, in physics in 1997). V.M.Fomin repeatedly presented the reports in this quality for the teachers and senior lecturers of the international education program. Among the alumni of Vasilii Mihailovich are now six doctors and 22 candidates of sciences. 1. Lichnoye dyelo V.M.Fomina. - Upravlyeniye kadrov Pryezidiuma SO RAN. 2. Fomin Vasilii Mikhailovich. Bibliografichyeskii ukazatyel' (k 50-lyetiyu so dnya rozhdyeniya). - Novosibirsk, 1990. - 49 s.
3. Vyedusciye nauchnyye shkoly Rossii. Vyp.1. - M., 1998. - S.96. 4. Intyerv'yu V.M.Fomina. Zapisala N.A.Kupyershtokh 27.03.1997 g.
5. Vystuplyeniye V.M.Fomina po novosibirskomu radio. Zapisala N.A.Kupyershtokh 12.12.1998 g.
6. Pyerova N. V dyelovom stilye // Nauka v Sibiri. - 1989. - N 14. - S.7. 7. Antonova G. Institut pyeryeshyel na lyetnyuyu zarplatu // Nauka v Sibiri. - 1992. - N 23. - S.3. 8. Chlyen-korryespondyent RAN V.M.Fomin // Nauka v Sibiri. - 1994. - N 16. - S.2. 9. Mironov S. Do i poslye sorokalyetiya // Nauka v Sibiri. - 1997. - N 26-27. - S.6-8. The source: Institut tyeoryetichyeskoi i prikladnoi myekhaniki: Gody, lyudi, sobytiya / Otv. ryed. A.M.KHaritonov. - Novosibirsk: Izd-vo SO RAN, 2000. - S.269-281: il. Updated: Wed Feb 27 14:46:32 2019. Size: 30,305 bytes.